Another month has passed, how time flies. For those of you that don't know yet, my son turned 1 year old today, so wish him a Happy Birthday please 🙂 You'll see him in an upcoming lesson, Lullaby. So with my fatherly bragging out of the way, hey, welcome to this months top lesson report. Every month I compile the most popular lessons on the site, based on what students have been learning. If you follow this series, you'll know that I do this not just because I find it interesting, but because I'm hoping through your seeing what other guitar students are up to, you'll practice more as well. Let's just get down to business, here are the most popular lessons from my site for the month of May. 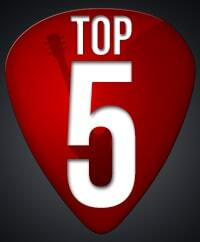 Before we start, I just want to tell you that the top list was intended to be a top 5 song lesson list, but since the basic lessons are consistently among the most watched lesson, I always expand my top lesson list to as many as needed, until 5 songs are represented. In May, we had 4 basic lessons among the top lessons, which means I'll be expanding the list to the "Top 9 lessons of May". This is a nice surprise, it looks like we had lots of new beginner electric guitar students on the site in may. Smoke on the Water is like Electric Guitar 101, all beginners need to learn it. It's cool and easy. This song is great for working on your barre chords, especially if you're still struggling with them. I'm glad you're learning this song, keep at it! Learning those barre chords is pretty much the toughest part of playing guitar, but you only need to learn them once, and they're your's for life. The second lesson in our series of 10 basic guitar lessons dives into the most popular chords beginners need to master. Learning those chords take practice of course, lots of it, but you’ll get there. They are pretty much the alpha and omega of playing guitar, remember that. This is another song that is among the top lessons month after month. The Spanish guitar lesson usually hovers around spot 5-8 every month. I really need to record some more Spanish style lessons, send me a letter if you want them as well, so I know. I actually remember when I started learning guitar, I looked at chord charts, and had not the slightest idea what it was trying to say. I've since learned that all guitarists start out the same. Keep in mind that everyone is a beginner at one time, and advancing only depends on how much effort you put into it. If you are a Santana fan, you might want to read this article on his life, I wrote it not too long ago. Santana is a great guitarist, and a great person as well. You don't get that combination often. I wrote a lengthy article on Chuck Berry as well, he is one of the fathers of rock n roll, so it's only fitting. Chuck Berry was a pioneer, but he wasn't such a "cool cat", and Keith Richards described. Nevertheless, respect goes out to Chuck. He is over 80, and still rockin' and rollin'. This basic lesson is the first in a series of 10 beginner lessons, which goes through the very fundamentals of playing the guitar. Despite the name, this is not the lesson you should start out with if you've never picked up a guitar though. All right, so there you have it, the top list of lessons for May. Keep practicing, it's the key to learning guitar. I'll be releasing a bunch of new lessons from this week on, finally got some studio time, sorry for the delay.